Real GDP is expected to grow at a 1.4% annual rate during the quarter, largely due to the weakness in consumer spending and housing at the end of 2018 and at the start of this year. The federal government shutdown also negatively impacted Q1 growth, as did weaker global economic growth and lingering uncertainty surrounding geopolitical events, such as Brexit and ongoing trade negotiations with China. Through all of this uncertainty, the US economy has continued to show a great deal of resiliency. The downward revision to Q4 GDP growth to a 2.2% annual rate effectively lowered the bar for the current quarter. US income growth has been surprisingly weak, with personal income rising just 0.2% in February after declining 0.1% the prior month. Most of the weakness was in farm income and income from interest and dividends. Wages and salaries rose 0.3% in both January and February. Tax payments also apparently jumped in January, resulting in a 0.2% drop in real after-tax income. The softer income data may explain the recent dip in consumer confidence, which fell 7.3 points in March but remains at a fairly lofty level. The hangover from the government shutdown has the statistical agencies lagging since only nominal income data are available through February. The latest real personal consumption data are for January and they rose just 0.1%, following a 0.6% drop in December. Much of January’s weakness in January was in durable goods, which plunged 1.6%. With incomes growing slowly, tax refunds running late and Easter falling late this year. Any shortfall would at least partially result in higher inventories, mitigating some of the damage to Q1 growth. US inflation continues to run slightly below the Fed’s objective. The overall PCE deflator fell 0.1% in January, and prices excluding food and energy rose just 0.1%. On a year-on-year basis, the core PCE deflator (the Fed’s preferred price gauge) is up just 1.8%. The lack of inflationary pressure gives the Fed plenty of latitude in holding off on any additional rate hikes. The US Federal Reserve’s favorite yield curve, the spread between the three-month Treasury bill and the 10-year Treasury note, remains slightly inverted a week after the longer-term rate fell below the shorter rate a week ago. A three-month bill yields 2.43%, just above the federal funds rate target of 2.4%, while the 10-year note yields 2.41%. Historically, an inversion of the yield curve has preceded recessions by 12 to 24 months. But between the point where the curve inverts and the onset of a recession, risk assets often rally, sometimes dramatically, which calls into question the usefulness of curve inversion as a leading indicator. While the Fed takes note of curve inversions, Dallas Fed president Robert Kaplan this week suggested that an inversion would need to be deeper and last for months to become a worry. Monetary policy tends to work with a lag and that there are still multiple Fed hikes working their way through the global economy. With debt levels at records and the global economy more dollarized than ever, its sensitivity to Fed policy may be higher than investors have appreciated. The Washington Post reports that the United States-Mexico-Canada Agreement, the trade pact negotiated last year to replace the North American Free Trade Agreement, has run into opposition on Capitol Hill, with Senate Finance Committee chairman Charles Grassley insisting that that the administration of President Donald Trump lift aluminum and steel tariffs imposed on Canada and Mexico as a precondition for the pact receiving a vote. US Trade Representative Robert Lighthizer has refused to lift the levies until Canada and Mexico accept quotas on their metals exports in an effort to keep Chinese steel from being re-exported to the US from the two countries, who also insist that the tariffs need to be lifted before the agreement can be ratified. The major indexes rose and erased most of the previous week’s losses, rounding out the best quarter for stocks in a decade. Industrials shares performed best within the S&P 500 Index, helped by a partial rebound in Boeing shares after the company announced a software fix for its troubled 737 Max airliner. Southwest and other airlines using the plane also recorded gains despite the emergency landing of a Southwest 737 Max 8 with no passengers on board on Wednesday morning. Utilities stocks performed worst, and the larger communication services sector also lagged, held down by weakness in telecom stocks following a Bloomberg report on Thursday that regulators were growing more skeptical of a proposed merger between T-Mobile and Sprint. Weakness in Alphabet (parent of Google), which accounts for a large proportion of the sector, also weighed on the segment. In the US, the jobs report is the most important release which is due out Friday. Average hourly earnings is expected to rise +0.25% month-on-month in March, which means an increase in the annual growth rate to 3.3% year-on-year, down from 3.4% year-on-year in February. Nonfarm payrolls is expected to rise 190k. In February, nonfarm payrolls only rose by 20,000, but this was likely a fluke, as nonfarm payrolls are very volatile. Overall, the labour market remains strong, but it is important to keep an eye on whether employment growth starts to decelerate. To be fair, arcane parliamentary rules forbid a third vote on British prime minister Theresa May’s deal with the European Union, so the government has separated the withdrawal agreement from the nonbinding political declaration and only the withdrawal agreement was put to a vote last week, and it failed by 58 votes. Further indicative votes on a way forward are scheduled for this week. Now that the withdrawal agreement has failed to pass, the new default is to provide the EU with a new way forward by 12 April or leave with no deal (which Parliament has repeatedly said it does not want). According to the MFS European rates strategy team, the chances of a longer Brexit extension, a new PM (with a Conservative Party leadership election) and a general election have all increased. Against this unsettled backdrop, the EU announced that it had completed preparations for a no-deal Brexit scenario. Britain’s balance of payments shortfall grew in the last few months of 2018, exacerbated by disappointing trade numbers as the world economy slowed and Brexit neared. The difference between money flowing in and out of Britain was negative to the tune of 23.7 billion pounds ($USD 30.9 billion) in the fourth quarter, bigger than a 23.0 billion-pound deficit in the third quarter, the Office for National Statistics said. Bank of England (BoE) Governor Mark Carney has said the big current account deficit leaves Britain reliant on “the kindness of strangers”. Lending to British consumers grew at its slowest annual pace in four-and-a-half years in February and banks approved fewer mortgages as Brexit approached, BoE data showed last week. The annual growth rate in unsecured consumer lending slowed to 6.3% from 6.5% in January, its weakest rise since September 2014, the BoE figures showed. 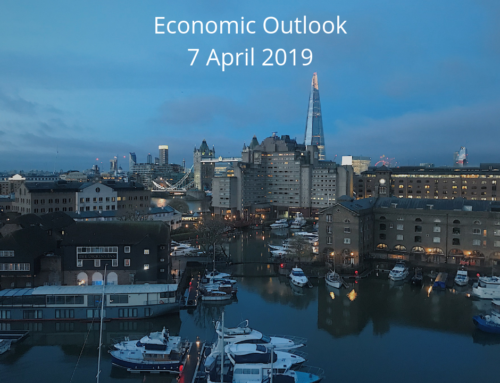 British consumers reined in their spending in late 2018 and have remained in a cautious mood in early 2019, faced with the possibility of the country leaving the European Union without a deal to smooth the economic shock. PMIs for March are due this week for a full picture of Q1. The service index (Wednesday) is expected to decline slightly to 50.8 from 51.3. For some time, the manufacturing index (Monday) has been higher than the equivalent index for the euro area, as UK manufacturers have stockpiled ahead of Brexit. This will likely still be the case but the downturn in Europe is strong enough to force the UK index down as well and a sharp fall which may happen soon cannot be ruled out. Speaking to a conference of ECB watchers in Frankfurt, European Central Bank president Mario Draghi reiterated that deteriorating external demand is tilting risks to the eurozone economy to the downside and that convergence with the ECB’s inflation target will be delayed. This implies the ECB will keep rates on hold for a considerable period to come. Draghi said the central bank is not short on tools to deliver on its mandate and said it is ready to respond if needed. The recent economic soft patch does not necessarily foreshadow a serious recession, he said. The yield on the 10-year German bund fell further into negative territory after Draghi said that the ECB could further delay any plans to raise interest rates if the European economy continues to deteriorate. He also mentioned that forward rate guidance could be adjusted and that the latest round of Targeted Long-Term Refinancing Operations, or TLTRO-III, which involves giving European banks cheaper long-term loans, can help mitigate the negative effect of low rates for banks. The preliminary March HICP inflation numbers are due on Monday. In February, headline inflation came in at 1.5% year-on-year, while core inflation fell to 1.0% year-on-year. Despite a strong pickup in wages, core inflation has fluctuated around this level for the last one and a half years. Although core inflation is expected to climb higher in 2019, the March core inflation print is likely to stay at 1.0% year-on-year, as the Easter effect will exert downward pressure on service price inflation, which might be even more pronounced following the methodological changes to German package tours. For headline inflation there could be scope for a rise to 1.7% year-on-year, driven by increasing energy prices. On Thursday, the minutes from the March ECB meeting will be released. At the latest meeting the ECB announced a new series of TLTRO3, opened the door for further easing, and extended the forward guidance to rates remaining at present levels ‘at least through the end of the 2019’. Of interest are the details of the discussion of the TLTRO3 announcement from members of the Governing Councils. Judging from recent communication, the ECB has become increasingly concerned about the side effects of a prolonged period of negative rates on bank profitability. However, a discussion on a tiered deposit system is unlikely to happen. Both Chinese manufacturing PMIs surprised strongly on the upside in a rare synchronised jump. Manufacturing PMI from Markit/Caixin leaped from 49.9 in February to 50.8 in March. The official manufacturing PMI jumped from 49.2 to 50.5, the biggest increase since 2012. Both sub-indices for new export orders (most notably the official one) increased, easing global growth fears somewhat. Following distortions from the Chinese new year in recent months and the general challenges with the quality of Chinese economic data, the March PMI may be interpreted as an outcome as a rather clear sign of a stimulus-induced rebound in economic growth. This growth rebound should become visible in the hard indicators over the coming couple of months. US officials reported progress in all areas under discussion in trade talks with their Chinese counterparts this week in Beijing. Movement on forced technology transfer was termed “unprecedented,” but sticking points remain in the areas of intellectual property and enforcement. Separately, China’s premier, Li Keqiang, said the country will sharply expand market access for foreign banks, securities and insurance firms. Regarding tariffs, economic adviser Larry Kudlow said some but not all China levies may stay in place if a trade deal is struck as part of an enforcement mechanism. Another round of talks is scheduled for next week in Washington. The key releases in China next week will be the PMIs from both Caixin and NBS. The Caixin PMI manufacturing rebounded sharply in February and it is expected to fall back a bit again from 49.9 to 49.6 (consensus 50.0) in March. However, the NBS PMI manufacturing dropped to a new low last month and it is likely to rebound from 49.2 in February to 49.7 in March. Looking through the month-to-month noise, Q1 will mark the bottom for Chinese activity and that stimulus and reduced trade tensions will pave the way for a moderate recovery during 2019.